Agnes Leona Swift was my great aunt. She was born on the family farm near Ainsworth, IA, on 16 July 1880, daughter of John C. Swift and Mary Rimmer. She attended rural School No. 4 and elementary and high schools at St. James in nearby Washington. She earned a teacher’s certificate and taught in a country school in Highland township, as well as a private kindergarten in Washington for a couple of years. She was a close friend to the Alex and Ola Miller family and provided childcare to their daughters Barbara and Ophelia. 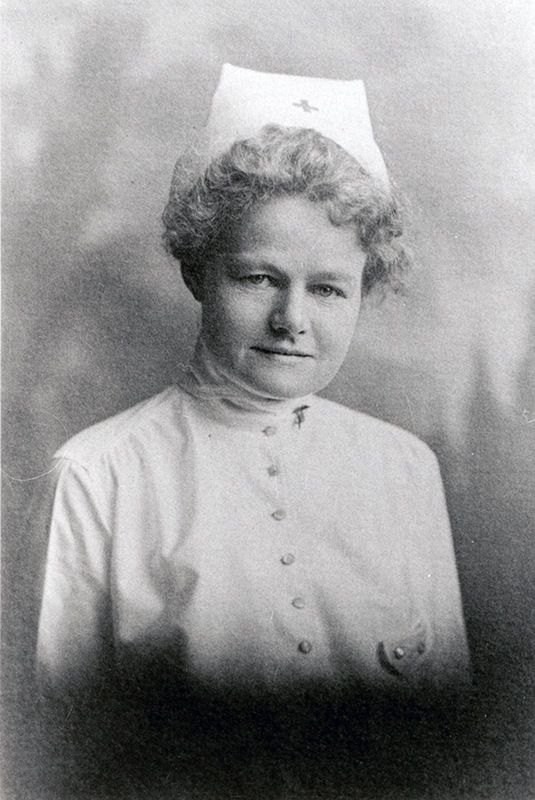 In 1905, she graduated from St. Anthony’s Hospital School of Nursing in Rock Island, IL, and served as a private duty nurse in communities around Washington, IA. In 1907, she served as hospital matron (supervisor) at Pleasant View Sanitarium, Washington, IA, and later at the Keota Hospital until 1915. In June 1911, Agnes was invited to accompany Dr. St. Elmo Sala, his wife, and Rosa Margrath, a surgical nurse from Rock Island, on a six-month tour of Europe. Dr. Sala, educated in public schools of Bloomington, IL and an 1892 graduate of the Keokuk (IA) Medical College, served on the medical staffs of St. Anthony, Mercy and St. Luke's Hospitals in Rock Island and Davenport. He wished to attend an X-ray training course at the Polyclinic Hospital in Vienna, and he generously invited Agnes and Miss McGrath to tag along. 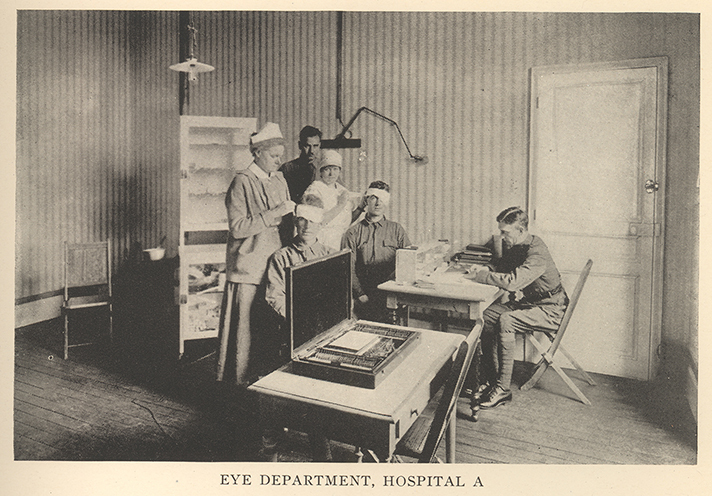 The trip included visits at medical institutions across Europe, as well as considerable sightseeing. The party made stops in Liverpool, London, Dublin, Edinburgh, Stockholm, Copenhagen, St. Petersburg, Brussels, Amsterdam, Hamburg, Berlin, Vienna, Paris, Florence, Rome and other cities. 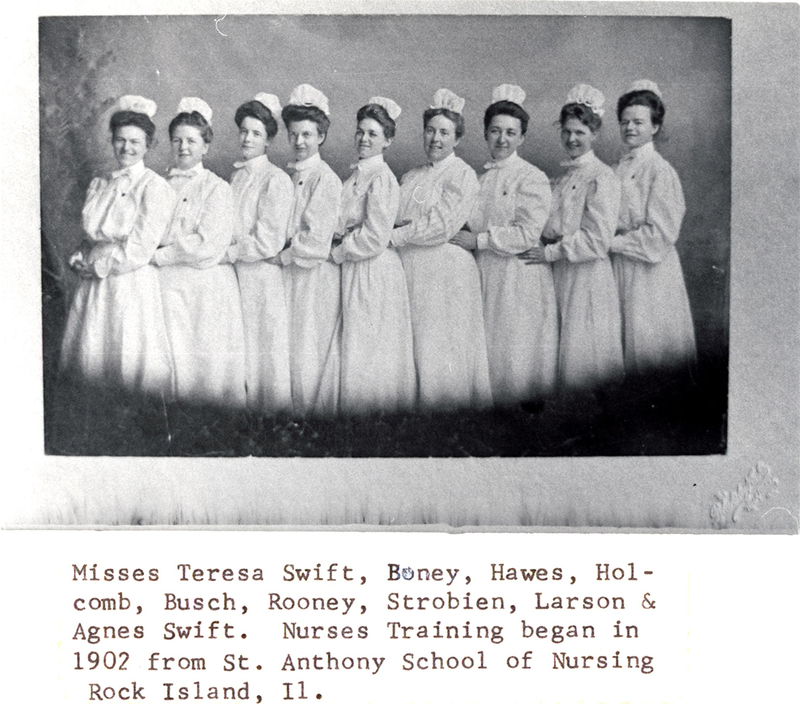 Graduating class of St. Anthony's Hospital School of Nursing, Rock Island, IL, 1905. Agnes Swift is in the middle row, far right. 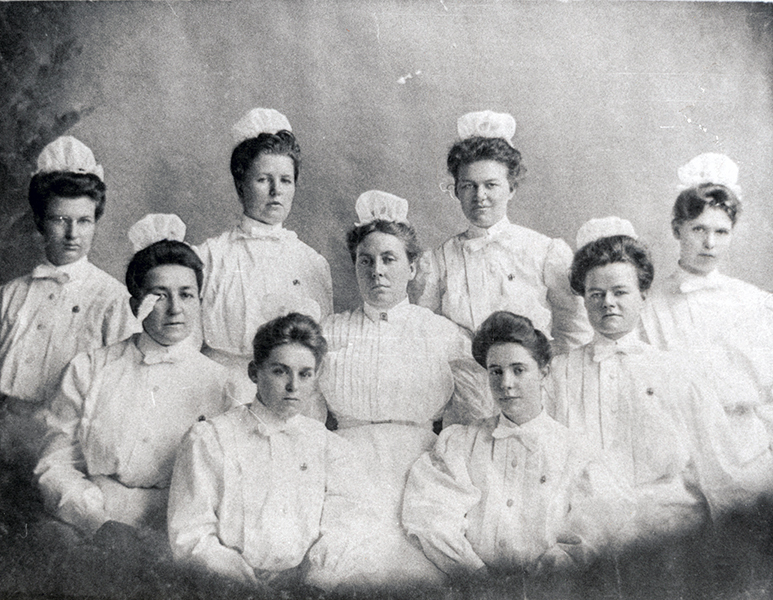 Her sister, Teresa Swift, is in the back row, second from the right. The others are unidentified. The graduating class of 1905 included Teresa Swift, Kathryn Boney, Mary Hawes, Mary Holcomb, Julia Busch, Margaret Rooney (may have been a supervisor), Mary Strohbehn, Signa Larson, and Agnes Swift. At the outbreak of World War I, Agnes volunteered for overseas duty with Unit R, organized by Dr. J. Fred Clarke, of Fairfield, IA. She took her oath of office on 7 December 1917 in Washington, IA, and received orders to report to Camp Bowie, TX. She remained there until 1 February 1918, when she reported to Ellis Island to prepare for embarkation. On 16 February 1918, personnel of Unit R boarded the SS Carmania and sailed for France to become part of US Army Base Hospital 32 at Contrexéville, France. Six hotels in the spa town of Contrexéville were leased from the French health ministry and converted for use as hospitals or lodging for hospital personnel. Base Hospital 32, originally planned for a capacity of 500 beds, was expanded to 1,250 bed before any American unit reached the town. A medical group from Indianapolis, arriving on 26 December 1917, provided personnel and equipment and began the task of cleaning and preparing the facilities. To provide additional personnel for the increased capacity, the War Department assigned Unit R to join Base Hospital 32. When Allied casualties mounted in September 1918, the hospital was ordered to increase its capacity once again (with no additional personnel) to an “emergency capacity” of 2,115 beds. By the time it was deactivated in February 1919, Base Hospital 32 had admitted 9,698 patients from 31 nations, including 189 German prisoners and many members of the local populace. A few days later, Base Hospital 32 began packing up to go home. 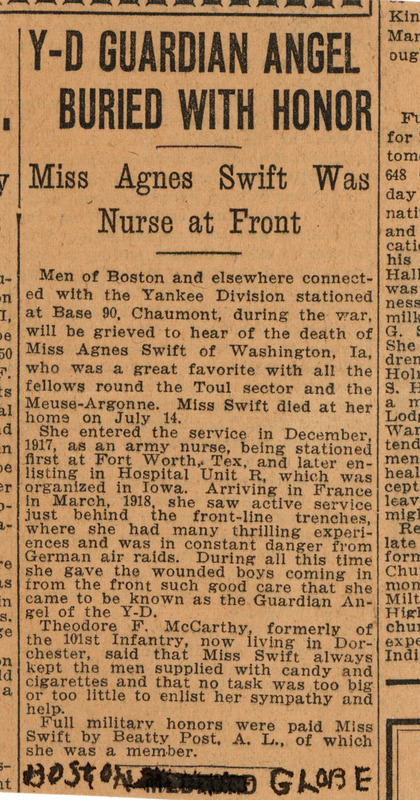 As others prepared to leave, Agnes joined 15 other nurses who volunteered to provide temporary relief for nurses at Base Hospital 90 in nearby Chaumont (AEF headquarters.) She served there from 17 January to 5 February 1919. One of her many talents was candy making, which she put to good use when it was possible. When there was time and she or one of the men could find the scarce sugar, she would make batches of divinity or fudge for her ward. The patients appreciated this homey touch so much that one of the men from the Yankee Division drew a cartoon of Agnes and her ward, adding remarks to contrast her Iowa upbringing with their city life. Agnes rejoined Base Hospital 32 in time to depart with the group on 19 February 1919, bound for home. But while most of the group boarded the SS America to depart from Brest on 4 March 1919, due to a lack of space, Agnes and eleven others were asked to wait for the next transport. She left France on 8 March 1918 on the USS Louisville and arrived in New York on March 22nd. 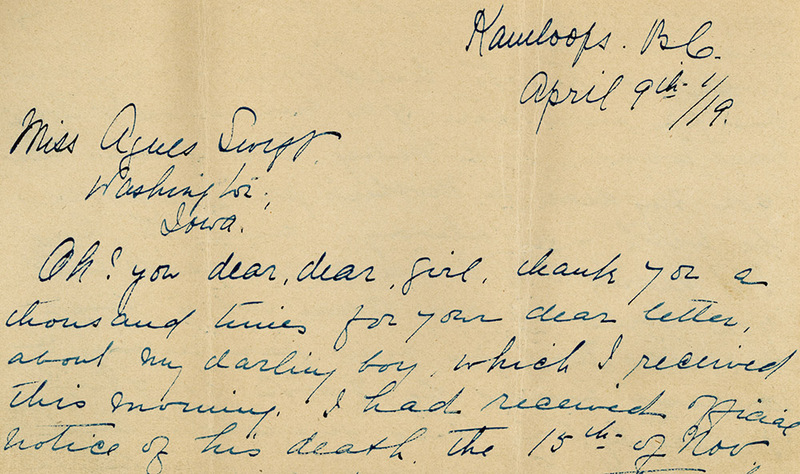 More than a few dying servicemen asked her if she would write to his wife or his mother to tell her they were comforted by the last sacraments or some special message they wanted to convey. One soldier left his gold ring for her to send to his mother, which she did. The grateful mother wrote a poignant letter in reply, a memento which remains to this day in the hands of Agnes’s family. Upon her return from overseas duty, Agnes had a bittersweet homecoming. She was warmly welcomed by family and friends in Washington but learned for the first time that her father had died in her absence. After a brief rest, she resumed private duty nursing and was employed for a short time at a hospital in Leon, IA, before returning to Washington to care for a sister who was dying of cancer. Agnes died in on 14 July 1923 in Washington, IA, and was laid to rest with full military honors in Elm Grove Cemetery on her 43rd birthday. The ceremony was attended by hundreds, including sixteen doctors and nurses of Unit R and grateful patients who traveled many miles to pay their final respects. 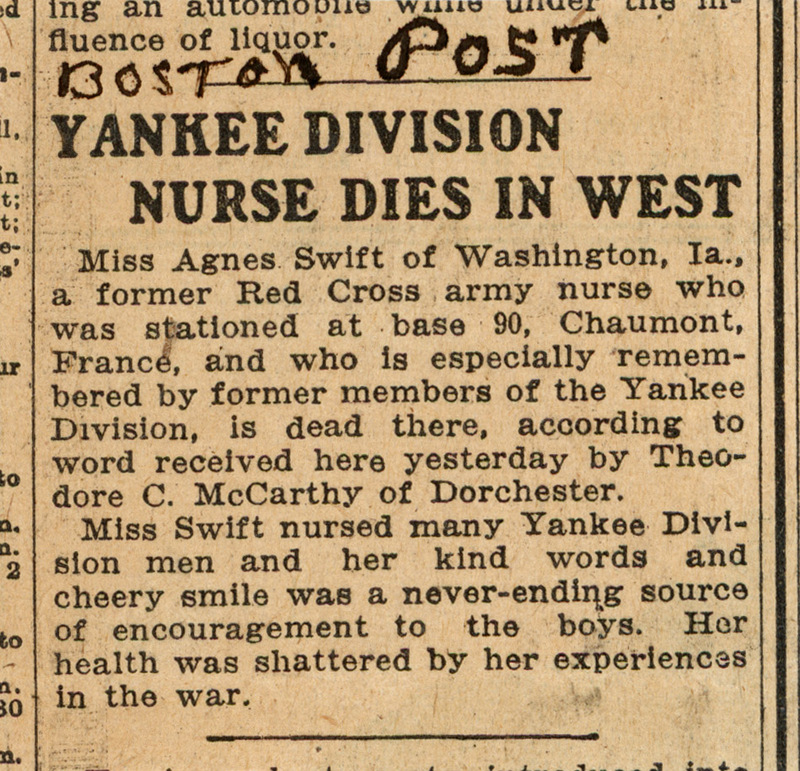 One grateful patient in Boston, MA, reported her death to the newspapers in that city so the word would reach the men of the Yankee Division. Bailey, Sister Joan. Private collection of digital images of family photos and artifacts. Private collection. Hitz, Benjamin D. A history of Base Hospital 32 including Unit R. Indianapolis, 1922. Swift, Agnes. Military record. Sister Joan Bailey collection. For more information about Contrexéville and Base Hospital 32, see the following website: http://mollydaniel.net/contrexeville.